As we indicated in Section 3-5, a diode is said to operate under large-signal conditions when the current and voltage changes it undergoes extend over a substantial portion of its characteristic curve, including portions where there is a significant change in slope. In every practical large-signal application, the diode is operated both in the region where it is well forward biased (above the knee) and into the region where it is either reverse biased or biased near zero volts. We have seen that such large excursions wiII change the resistance of the diode from very small to very large values. One of the most common uses of a diode in large-signal operation is in a recttjier circuit. A rectifier is a device that permits current to flow through it in one direction only. It is easy to see how a diode performs this function when we think of it as a voltage-controlled switch. When the anode voltage is positive with respect to the cathode. i.e .. when the diode is forward biased, the “switch is closed” and current flows through it from anode to cathode. If the anode becomes negative with respect to the cathode, the “switch is open” and no current flows. Of course, a real diode is not perfect. so there is in fact some very small reverse current that flows when it is reverse biased. Also, as we know, there is a nonzero voltage drop across the diode when it is forward biased (0.3 or 0.7 V), a drop that would not exist if it were a perfect switch. result of the current pulses that flow through it. 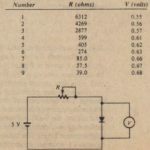 Note that the net effect of this circuit is the conversion of an ac voltage into a (pulsating) de voltage, a fundamental SkI’ in the construction of a dc power supply..
2. When e(/) = 1.5 sin wt, the peak positive voltage generated is 1.5 V. At that instant, VII(t) = 1.5 – 0.7 = 0.8 V and i(t) = (0.8 V)/(1.5 kfl) = 0.533 mA. The waveforms are shown in Figure 3-20. Note once again that the diode does not conduct until e(t) =:; 0.7 V. However, in this case, the time interval between e(t) = o V and e(t) = 0.7 V is a significant portion of the conducting cycle. Consequently, current flows in the circuit for significantly less time than one-half cycle of the ac waveform. In this case, it clearly would not be appropriate to use Figure 3-16(a) as an approximation for the characteristic curve of the diode. The simplest kind 01 filter that will perform the filtering task we have just described is a capacitor. Recall that a capacitor has reactance inversely proportional to frequency. X; = 1/2lT/C. 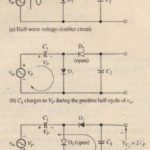 Thus, if we connect a capacitor directly across the out!~~:i vI a half-wave rectifier, the ac components will “see” a low-impedance path to ground and will not therefore, appear in the output. Figure 3-21 shows a filter capacitor C connected in this way. In this circuit the capacitor charges to the peak value of the rectified waveform, V/,II’ so the output is the dc voltage VpR• Note that V/,II = EI, – Vv, where E/, is the peak value of the sinusoidal input and VD is the de voltage drop across the diode (0.7 V for silicon). In practice, a power supply must provide de current to whatever load it is designed to serve, and this load current causes the capacitor to discharge and its voltage to drop. The capacitor discharges during the intervals of time between input pulses. Each time a new input pulse occurs, the capacitor recharges. Consequently, the capacitor vol tage rises and falls in synchronism with the occurrence of the input pulses. These ideas are illustrated in Figure 3-22. The output waveform is said to have a ripple voltage superimposed on its de level. As in the half-wave rectifier, the full-wave rectified waveform can be filtered by connecting a capacitor in parallel with load RL• The advantage of the full-wave rectifier is that the capacitor does not discharge so far between input pulses, because a new charging pulse occurs every half-cycle instead of every fun cycle. Consequently, the magnitude of the output ripple voltage is smaller. This fact is illustrated in Figure 3-24. Although the elementary power supplies we have described can be used in applications where the presence of some ripple voltage is acceptable, where the exact value of the output voltage is not critical, and where the load does not change appreciably, more sophisticated power supplies have more elaborate filters and special circuitry (voltage regulators) that maintain a constant output voltage under a variety of operating conditions. These refinements are discussed in detail in Chapter 16.
line between one side of a voltage source and ground. In this convention, it is understood that the opposite side of each voltage source shown in the figure is connected to ground. If the reader is not comfortable with this convention, then he or she should begin the process now of becoming accustomed to it, for it is widely used in electronics. As an aid in understanding the explanations given below, redraw each circuit with all ground connections included. For example, Figure 3-27 shows the circuit that is equivalent to Figure’ 3-26(c). 2. In (b) the anode side is more positive than the cathode side (+10 V> +5 V), so the diode is forward biased. Current flows from the lO-V source, through the diode, and into the 5-V source. 4. In (d) the cathode side is more negative than the anode side (-12 V < -5 V), so the diode is forward biased. Current flows from the – 5-V source, through the diode, and into the -12-V source.’ . 5. In (e) the anode is grounded and is therefore at 0 V. The cathode side is more negative than the anode side (-10 V < 0 V), so the diode is forward biased. Current flows from ground, through the diode, and into the -10- V source. Figure 3-28 shows a diode switching circuit typical of those used in digital logic applications. It consists of three diodes whose anodes are connected together and whose cathodes may be connected to independent voltage sources. The voltage levels connected to the cathodes are called inputs to the circuit, labeled A, B, and C, and the voltage developed at the point where the anodes are joined is called the output of the circuit. All voltages are referenced to the circuit’s common ground. The voltage source V is a fixed positive voltage called the supply voltage. The figure shows the conventional way of drawing this kind of circuit (a), and the complete equivalent circuit (b). Vo = 5 V + 0.7 V == 5.7 V. Suppose now that input A == 0 V and B = C = +5 V, as shown in Figure· 3-31(a). It is clear that the diode connected to input A is forward biased. If wetemporarily regard that “ON” diode as a perfect closed switch, then we see that the anode side of .111diodes will be connected through this closed switch to 0 V. Therefore, the other two diodes have +5 V on their cathodes and 0 V on their anodes, causing them to be reverse biased. In reality, the “ON” diode is not a perfect switch, so it has some small voltage drop across it (across the 300 fl) and the anodes are near 0 V rather than exactly 0 Y. The net effect is the same: one diode is forward biased and the other two are reverse biased. If we regard the drop across each diode as 0.7 Y, then V” = 0.7 Y. as shown in Figure 3-32(c). The diode circuit we have just analyzed is called a diode A 0 gate because the output is high if and only if inputs A and Band C arc all high. We have seen that the first step in this kind of analysis is to determine which diodes arc forward biased and which are reverse biased. This determination is best accomplished by temporarily regarding each diode as a perfect, voltage-controlled switch. At this point one might legitimately question how we determined that the forward-biased diode shown in Figure 3-31 is the only one that is forward biased. After all, the other two diodes appear to have their anode sides more positive (10 Y) than their cathode sides (5 Y), and seem therefore to meet the criterion for forward bias. However, if this were the case, then these “ON” diodes would, as closed switches, connect +5 Y to the anodes, which in turn would forward bias the third diode (since its cathode is at 0 V). The third diode would then act as a closed switch connecting 0 V to the anodes. Here, then, is the dilemma: how can the anodes be simultaneously at 0 Y and at 5 Y? Obviously they cannot, and this contradiction proves that only the one di.ode shown i.n Figure. 3-3\ can be. forward biased. 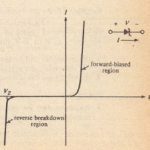 The fact that it is forward biased, and therefore connects 0 Y to the anodes, ensures that the other two diodes are reverse biased. A rule that is useful for determining which diode is truly forward biased is to determine which one has the greatest forward-biasing potential measured from the supply voltage to its input voltage. For example, in Figure 3-31, the net voltage between the supply and input A is 10 Y – 0 Y = 10 Y, while the net voltage between the supply and inputs Band Cis + 10 Y – 5 Y = 5 V. Therefore, the first diode is forward biased and the other two diodes arc reverse biased. Determine which diodes are forward hiase-d and which are reverse biased in the circuits shown in Figure 3-33. Assuming a O.7-Y drop across each forward-biased diode, determine the output voltage. Notice that the diode positions are reversed with respect to those in (a) and (b), in the sense that the cathodes are joined together and connected through resistor R to a negative supply. Thus, the diode for which there is the greatest negative voltage between supply and input is the forward-biased diode. In this case, that diode is O2, 0\ is reverse biased, by virtue of the fact that its cathode is near +5 V and its anode is at -5 V. Figure 3-35 shows the equivalent circuit path between input and output. 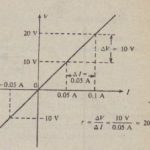 Writing Kirchhoff’s voltage law around the loop. we see that Vi’ = 5 V – 0.7 V = 4.3 V.